I know you all remember my dear friend Leyla Firefly, owner of and designer for Belle Belle, right? I’ve blogged her on Second Spaces approximately 5481247 times, so you definitely should. WELL…she’s been kinda quiet for a while, and suddenly resurfaced a few weeks ago with big news! No more Belle Belle!! What?!!? No worry, though — Leyla has started a new venture, a precious little sim called Firefly. You’l find more than just furniture here — there’s clothing and tattoos and eyelashes…and more that I’m sure I missed. 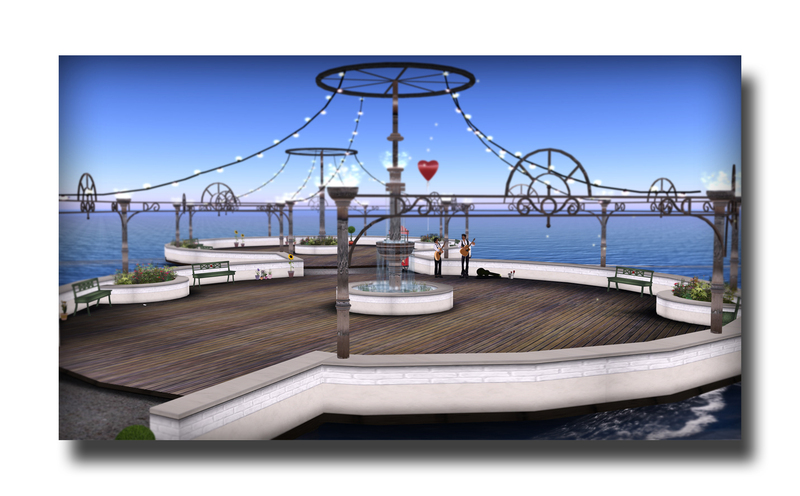 There’s also a party bus, and a gorgeous promenade stretching out over the water. There’s ALSO a mechanical bull. For which to ride. Aww yeah. The first thing I noticed, however, is that my pal Heidi is currently in the number one spot on the leader board. The SECOND thing I noticed is that I would win 500L if I beat her score. IT WAS SO ON. Let’s talk about furniture. Leyla is still planning to release new items when she has the time and inspiration strikes…and that makes me happy. She does have the new Piri set available at Firefly – an adorable, shabby chic set with a color scheme that is totally 70s reminiscent for me. Love! Feeling regrets that you didn’t pick up nearly as much Belle Belle furniture as you wanted, before it was gone? THIS IS YOUR LUCKY DAY. Leyla just sent a note out this morning to announce that all the Belle Belle items are now on Marketplace AND that she’s going to have a super deal every day!!! 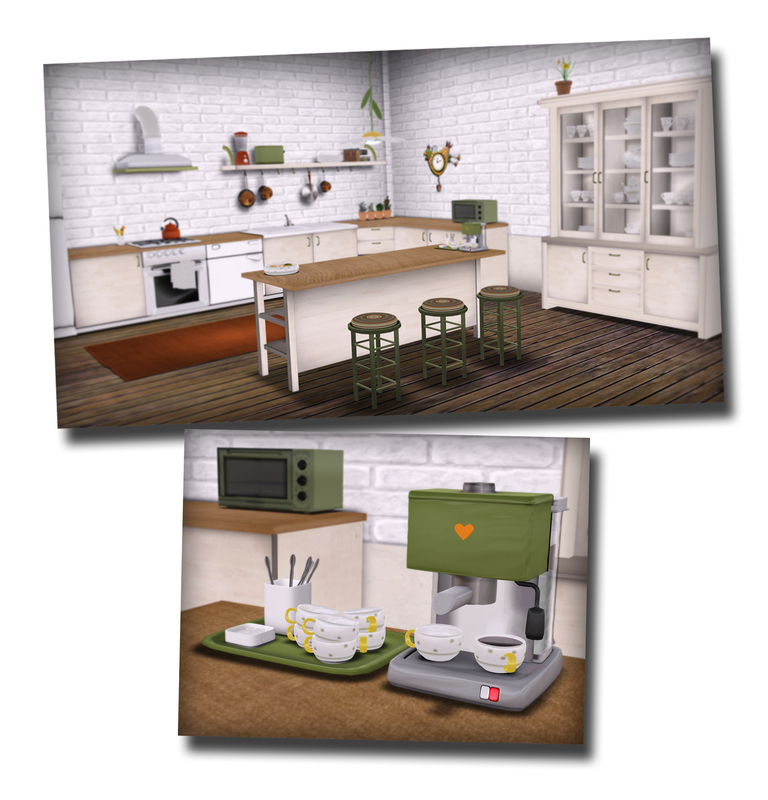 Today’s deal is the entire Raffia Office set for ONLY $L250!!! Crazy! Leyla Firefly of Belle Belle has just released the most adorable little snow hut EVER. 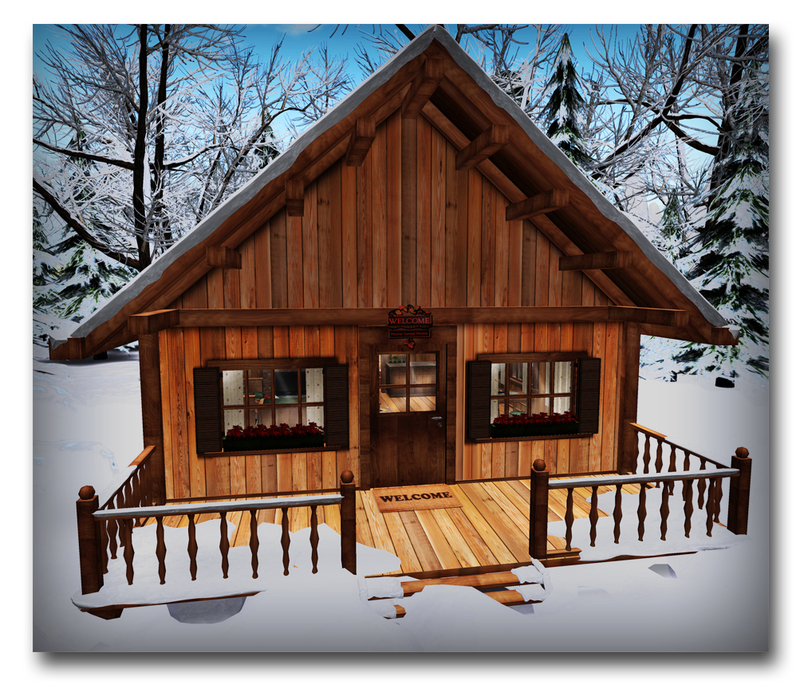 The Apres-ski Snow Hut comes furnished or unfurnished – and precious in either version – and Leyla was sweet enough to send me a copy of the furnished version, in which I have been playing house all afternoon. Alright, dear readers – I’ve got some more holiday awesomeness to share with you! 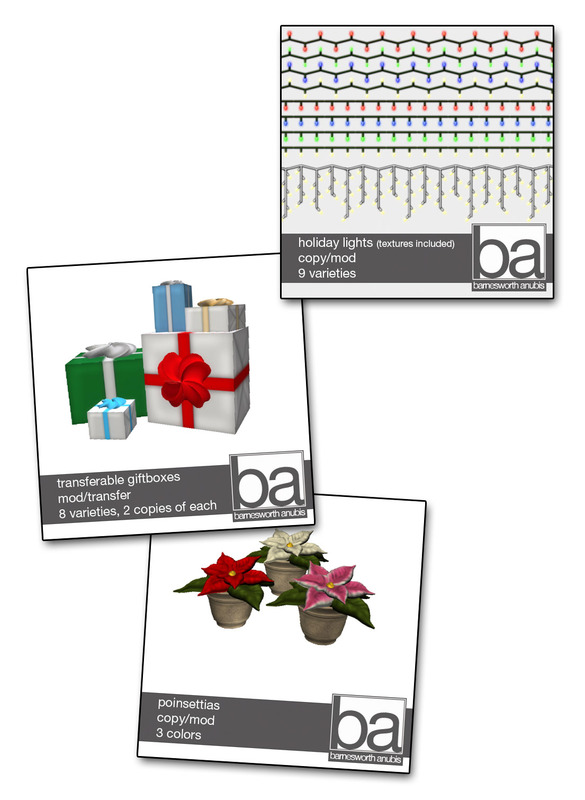 [ba] Holiday Shop: Barnesworth Anubis has opened his holiday shop! Great trees, lights, poinsettias, and more! If you get over there super quickly (because I didnt get this blogged early enough 😦 ) you may be able to catch the very end of his 50% off sale, scheduled through Dec 6 (that’s now)! Even if you miss the sale, you still need to go – great stuff at any price! 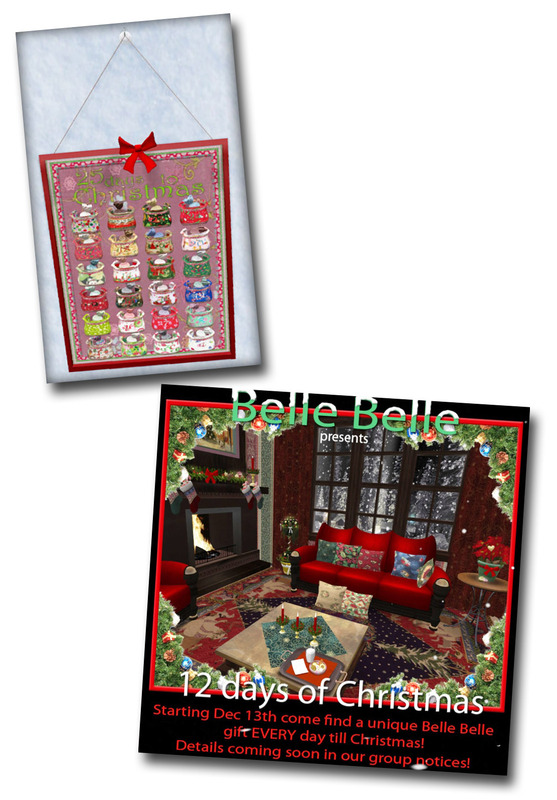 Belle Belle: Leyla has her holiday display out and you absolutely must go and see! A lot of the items from last year have returned, so I’m going to cheat and link you to my post from last year – which is here. There are also some new items that you have to check out, and more importantly – as I’ve told you over and over! – you MUST join the Belle Belle group! She gives awesome presents! 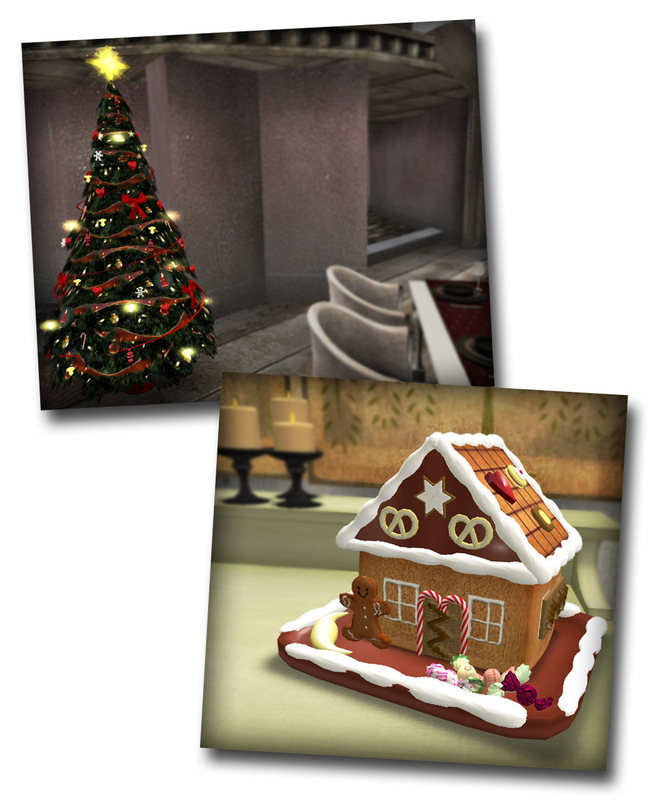 The first pic below is the Advent Calendar, available now in the lucky boards (for members only). You’ll also see in the poster below that Leyla is planning a 12 Days of Christmas event, with freebies everyday from the 13th until Christmas! Make sure you’re in the group so you don’t miss out! Leyla is so sweet and sent me some items to spruce up the windmill. I love the tree, so traditional…and I may have tried nomming on the gingerbread house, who’s to say? It looks so yummy! (Elate!) 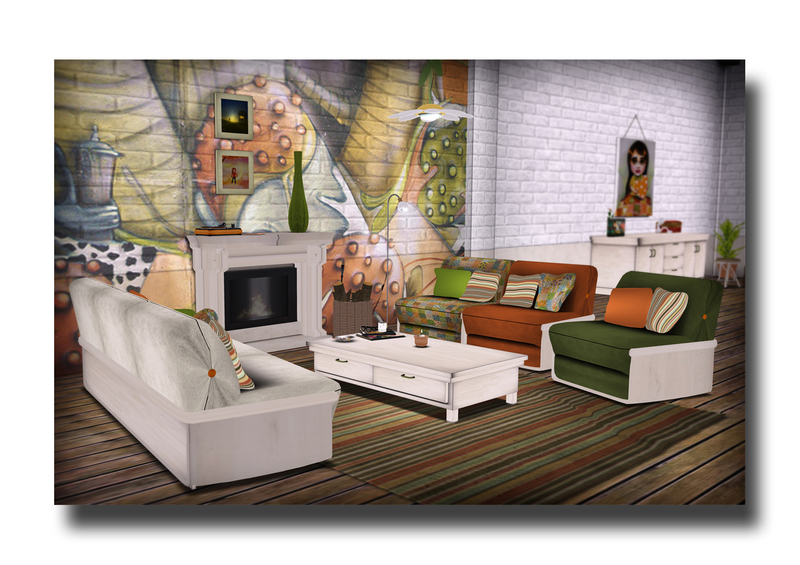 Beach House: Last week I blogged about Kellie Iwish’s new beach house – now she’s released a new version with color-change walls! If you already bought the house before the update, Kellie has sent replacements…and if you didn’t buy it already, well, now’s as good a time as any! The new colors are below; they’re like house candy! Belle Belle: A few things from one of my favorites! First, there’s a new group gift available — and I’ve told you repeatedly that you should join the group, because Leyla gives the BEST group gifts! This time around it’s a precious little kitchen paper towel holder – how convenient! NOW, for the really exciting info: when I wandered into the shop to look for the hunt gift, I found that Leyla has just released 6 rooms of steampunk awesomeness called Aether. Like, seriously awesome. Like, so awesome that I told my best guy Giskard that he had to log in NOW to see it. It couldn’t possibly wait. SO, what that means is that you need to get over there NOW and see it for yourself. Here are pictures to further tempt you, but really, you need to see it up close and personal to really absorb all the amazing details. I totally want it all. By the way, other than cropping and edge shadows, I didn’t post-process these pics at all. Leyla has truly made it all look just that amazing. Oh, and be sure to grab your free steampunk goggles from the stand in front of the Aether displays. Who can’t use a good pair of steampunk goggles? Good afternoon! Just a few updates for you from around the grid. Good stuff! Belle Belle – I adore Leyla Firefly’s latest set, Raffa. 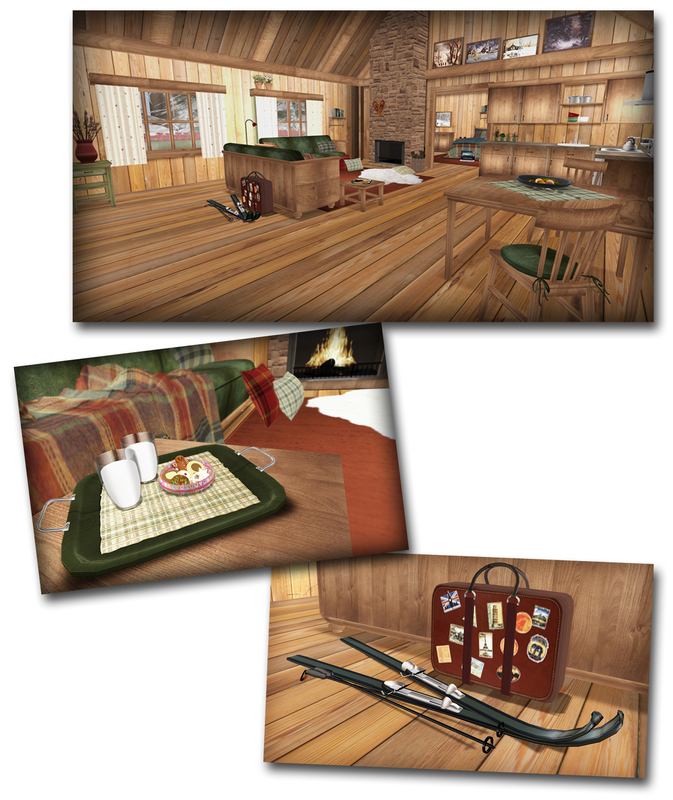 As always, there are multiple rooms in the set: living, kitchen, dining, bathroom, bedroom, and office. Gorgeous leather texturing on the living room pieces, and the stone wall/fireplace is awesome. I also really enjoy the flat file in the office – I have a weird fascination with file cabinets, and this style is one of my favorites! Leyla has also just added a gorgeous Flower Fountain to the Lucky Boards! The boards are for Belle Belle group members only, so if you’re not already a member, then you need to join! I’ve shared with you before that Leyla gives awesome group gifts…you need to get in on that! Gwendolyn Bieler Interior Design: Gwendolyn let me know that she has a $1L cabana now available in her shop! This is an amazing deal – you get the cabana, daybed, 2 lounge chairs, ceiling fan, 2 towels, rug, AND the deck for just $1L!! I love a red striped awning! Cute!! I had heard whispers of a fairly new furniture shop opened by my pals, Serendipity Nerd and Windy Crawford, and I just finally made my way over today to check out Nove. It’s still a small inventory, mostly nice basics in a cottage style, and certainly worth a visit to see. I really like their cute little cottage bathroom – specifically, I love the details and accessories! My favorite piece in the shop is the Get To Work desk (also available in black). This is so cute with its double-sidedness, and I adore the hanging baskets on the side! Precious!